SPICING UP BACKYARDS SINCE 1989. Grill Dome was founded by Tarsem Kohli in Atlanta, GA over 25 years ago. At that time ceramic cookers available in the market could only withstand very low cooking temperatures of only 300 to 350 degrees before cracking. As an engineer at heart, and an avid griller, Tarsem felt it would be a good challenge for him to research and develop ceramics that could not only withstand higher temperatures, but also actually improve your ability to cook more consistently. Fire is a phenomenon that is wild and therefore hard to control, but most grills designs do little to address this. Tarsem felt it was important to create a cooker that was built of better materials and also engineered to produce more consistent cooking results. In 1989, GRILL DOME set out to bring the best ceramic composition and best engineered design to market. First, Tarsem was able to develop an original ceramic blend that could withstand twice the temperatures of the ceramics available on the market at the time. With this new technology, GRILL DOME was the first company to offer warranties on its ceramic components. 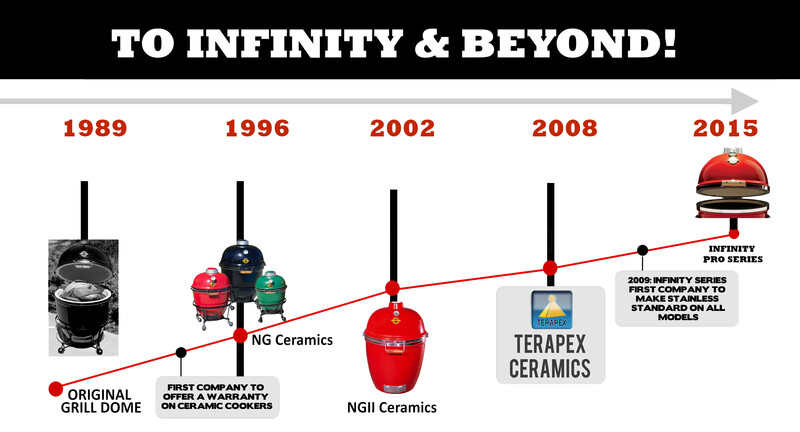 Then as the research continued over the years and the ceramics improved, GRILL DOME became the first company to offer a Lifetime Warranty on its ceramics - a concept unheard of at the time. Another key factor in the performance of a kamado is its ability to hold heat in without leaks that can make a cook more unpredictable. Today, Grill Dome includes a 5 year warranty on gaskets seals. Since these early days, GRILL DOME has expanded its lineup to three sizes with distribution in US, Europe, Asia, and Australia. From the beginning, Tarsem felt these products are meant to be centerpieces of people’s backyards and living spaces and wanted to offer a color selection that would help compliment and SPICE UP the landscape instead of just blending in. Needless to say customers agreed and have been spicing up their backyards since 1989. More recently, Grill Dome officially became a family business. After growing up around the business for many years, Tarsem’s son, Ashish decided to leave his corporate life to join Grill Dome. Grill Dome is now working on its next generation of products. Grill Dome has released its 5th generation of cookers in 2015 - now called the Infinity PRO Series. Please find out more here about our latest generation of grills - CLICK HERE. Grill Dome released the Infinity Series, its 4th generation of cookers, in the fall of 2009. With the Infinity Series, Grill Dome made 304 Series Stainless Steel hardware and its exclusive Featherlite Hinge standard with all its models. THOUSANDS OF CUSTOMERS AGREE - GRILL DOME IS THE BEST! 2) The variety of what you can cook on the GD is virtually unlimited, burgers, sausage, turkeys, chickens, steaks, roasts, fish, pizzas! 3) All natural cooking, no chemicals, no gas all very natural, food tastes better and is better for you! 5) Easy to use. Tried to keep this for myself but my wife wanted in on the experience. Actually a very simple process to controlling the heat. 7) Low cost to operate, one load of the lump wood can last for 30 hours of cooking time! 10) The wow factor! You will be the grilling guru in everyone's eyes after they see your unique GD. The colors are great, make your own table, the GD is a work of art!